For the first time in my life I have been dreading Christmas to a certain extent. It will be the first Christmas without my father. My father was Mr. Merry Christmas. He absolutely loved everything about Christmas and it was the time of year the child in him shone the brightest. It was very important to him to make sure his wife and daughters had a special Christmas every year even when the budget was very slim. He always had a mystery gift that he wrote silly rhyming clues for us to follow in our search for this mysterious prize. He spent hours making gifts in his wood shop and writing his clever clues through the years. It was extremely important to him for the true reason for the celebration of Christmas to be remembered. He wore and gave away buttons that said “Keep Christ in Christmas” and “Merry Christmas” on them. In fact we had instructions to have “Keep Christ in Christmas” carved into his tombstone. The fact that God so humbly came to this earth as a baby to ultimately die for us to save us from our sins was overwhelmingly awesome to my father. He would be so giddy, joyful, and generous because of truth in the reason for celebrating Christmas. It is Jesus’ birthday!! We are starting some new traditions this year with helping mom carry on dad’s Christmas legacy. I must admit yesterday when decorating in my own home I felt grumbly and grouchy doing so. One ornament at a time my youngest daughter and I got it done. With each ornament there was greater ease in hanging the next. With grief sometimes it is one breath at a time and in this case it was one ornament at a time. Today my sister and her family and my family all joined forces to help mom get dad’s outside decorations up and to decorate the inside Christmas tree. A display for the neighborhood to remember that it is Jesus we celebrate and why. I sat down to help get ornaments out of boxes for the kids to hang and opened the ornament pictured above. Inside the box remained the gift tag. “To: Dad, From:Anita” The year of the ornament was 1998. This was the year before Mike and I were married. Before I even knew I would have two daughters. 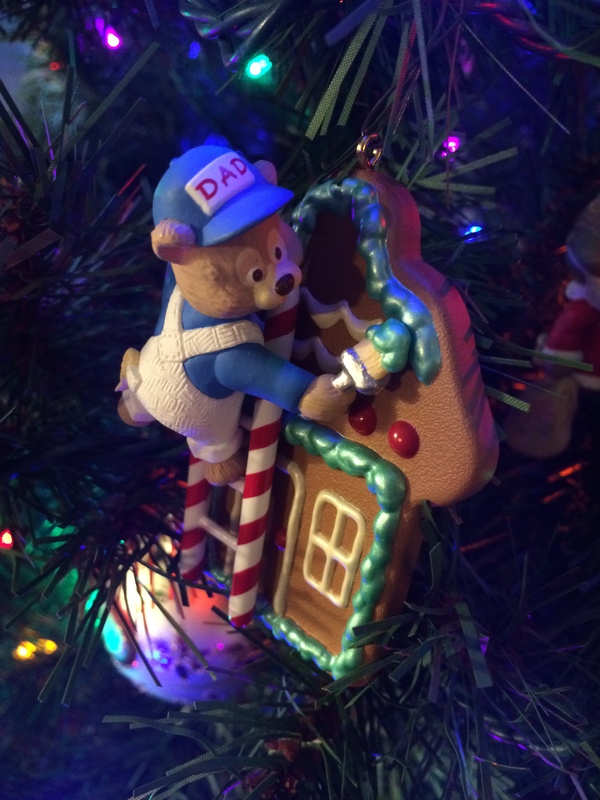 I had forgotten all about that ornament and the fact that it was perfect for my dad. 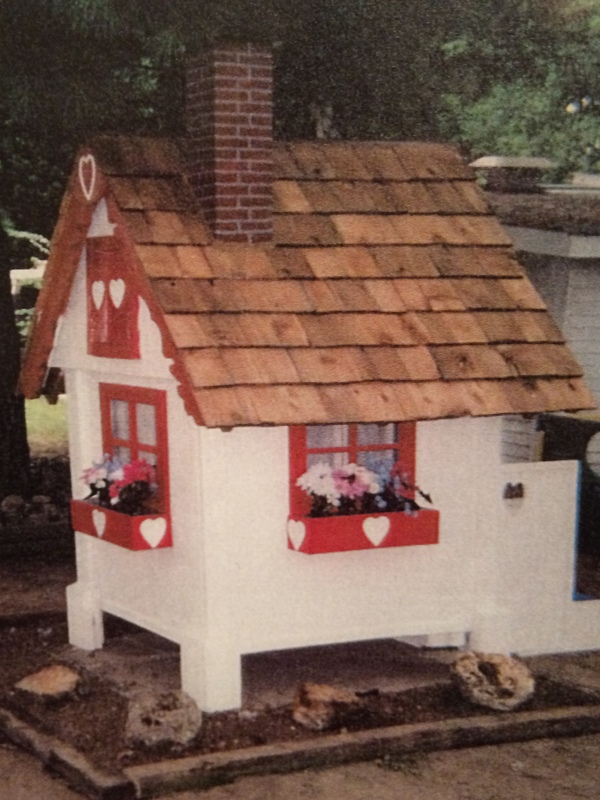 My father had built a little playhouse for my sister and I when we were little girls. It was made mostly from scrap wood and had gingerbread style décor much like this ornament. At that time I wouldn’t have known that my father would rehab this little playhouse two more times for my own children. In the year of 2014 this ornament has even deeper significance. For families who are grieving it is impossible to fill the missing space that is there. Lives that make such an impact on their families and circle of influence are never really gone. Hold your families close and make wonderful memories. Love and be generous to all people. Most of all remember that God loved us so much to send His One and Only Son and that is why we celebrate! This everlasting life that God gives is the reason to celebrate Jesus. Because of Jesus I will get to see my father again! I still miss my Dad… I am sorry for your struggle. I have said the very things you write, “when a life makes such an impact on others”… and have missed him always being there, always having wisdom and strength, always telling us we have a greater Father who is in Heaven. Some times are still tough, his birthday, father’s day, the graduation of his grand daughter… Yet, I firmly agree with you that we will see our loved ones again. My prayers for you and your family.